It’s time for that epic pumpkin freak out — when everything pumpkin is consumed in mass quantities. Pumpkin bread, pumpkin pie, and pumpkin coffee seem to be everywhere this time of year. Pumpkins seeds are also a fall favorite for their nutty flavor and added health benefits. Choosing this autumnal treat can boost your intake of important nutrients for your body’s health, but it also comes with a few risks. They are protein packed. According to the Journal of Agricultural Science and Technology, pumpkin seeds are made up of 41 percent oil and 25 percent protein. This means that 1/4 cup of dried and shelled pumpkin seeds can provide you with 20 percent of your daily recommended protein. Pumpkin seeds also contain important minerals and nutrients. Linoleic acid, potassium, magnesium, manganese, zinc, selenium, copper, and chromium make this snack a useful source of many essential nutrients. Because of their high concentration of zinc, the Mayo Clinic has included pumpkin seeds in their list of recommended foods to benefit eye health. Pumpkin seeds are a rich source of antioxidants and have been shown to improve a variety of conditions including inflammation and heart disease. And while more research is needed, some studies have found a positive relationship between pumpkin seeds and bladder function. Because of their high fiber content, the American Heart Association recommends eating a handful of pumpkin seeds for a healthy and portable snack. However, because pumpkin is a natural plant in the gourd family and the shells on the outside of the seed can be hard, there are a few cautions related to consumption. If eaten in abundance, pumpkin seeds can cause severe constipation and even bowel impaction. While this is a rare condition, eating a large amount of pumpkin seeds and then experiencing bowel issues has been reported. Chewing on raw pumpkin seeds with the shells on can also put undue stress on your teeth. This can lead to enamel loss and even fractures. However, roasting or baking pumpkin seeds can make the shells more bearable to chew and lessen the adverse effects. While uncommon, allergic reactions to pumpkin seeds and pumpkin seed flour have been reported. Reactions included itching, swelling, and asthma. Pumpkins are a sprout and sprouts have been connected with foodborne illnesses such as E. Coli. According to Penn State Extension, most sprouts are safe to eat. However, in some groups of people, foodborne illness can lead to serious complications. For example, if you are pregnant, you should check with your doctor to evaluate your risk. If you do decide to indulge in your taste buds and seek some of the health benefits of pumpkin seeds, try this recipe! Preheat oven to 325 degrees. 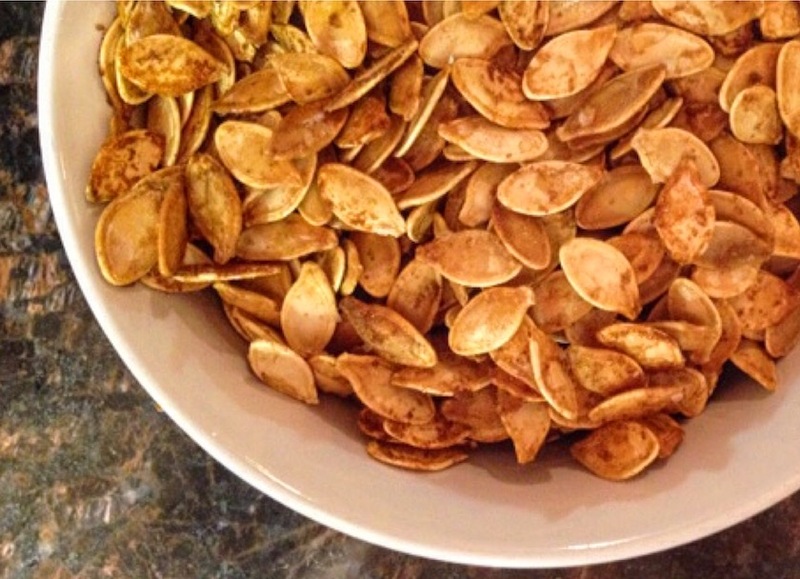 Mix one cup of clean pumpkin seeds with one teaspoon of oil if you want to salt the seeds. Spread the plain or oiled seeds on a baking sheet. Bake for about 8 minutes or until lightly browned. Watch carefully. Seeds brown quickly. Sprinkle the oiled seeds with 1/4 teaspoon salt or other favorite seasoning while hot. Are Seeds Good or Bad for Cholesterol Levels?